Put an end to forgotten passwords and insecure password storage! 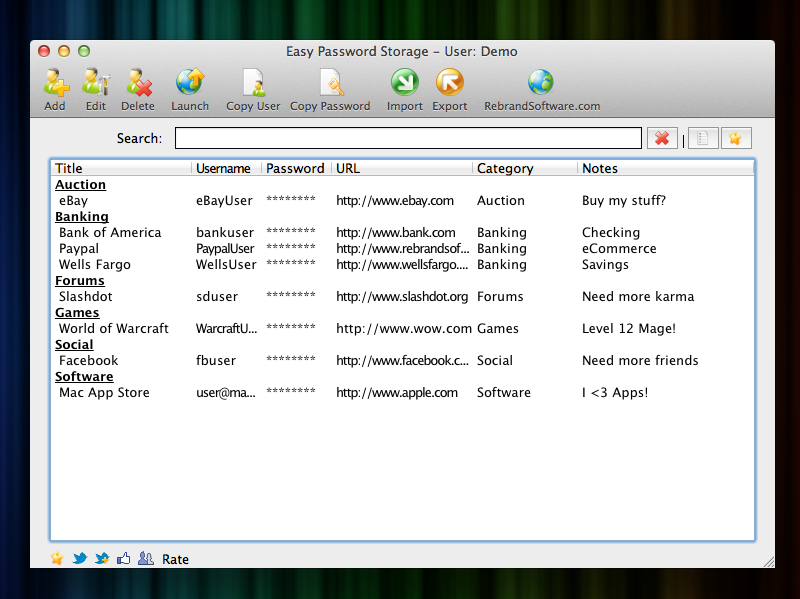 Easy Password Storage keeps your passwords safe but accessible on Windows and Mac. One master password protects and encrypts all of your valuable information. Put an end to forgotten passwords and insecure password storage! Easy Password Storage keeps your passwords safe but accessible on your Windows or Mac computer. One master password protects and encrypts all of your valuable information. Your passwords are protected with your choice of three industry standard encryption types with up to 448 bit encryption: Advanced Encryption Standard (AES), Blowfish or Serpent. The availability of three encryption types means your passwords are even more secure! Simply create a username and a master password. Your master password is then used to access all of your other passwords. -Type in the search box to instantly search all fields simultaneously -View entries by category or alphabetically -Launch associated websites and copy your password in one click -Clear passwords from the clipboard after 30 seconds -Generate secure passwords -Import and export password lists -Multiple users: ideal for families or for separating your more sensitive passwords Try it today, and never forget a password again! Data Recall is Windows-based application that will easily and securely store of all of your critical data. Data Recall allows you to store an unlimited number of user names, passwords, web site URL's, insurance policies, bank accounts, and much more. Convenient PocketPC-based tool for safe storage of confidential information. PocketSafe provides the comfortable management and secure storage of passwords, nicknames, credit card, bank account and document data on your PDA. Asterisk Password is a Windows dialogs, Protected Storage and LSA Secrets password recovery tool. It allows you to view passwords hidden behind the asterisks in password fields. Shows Windows Protected Storage and LSA Secrets contents. A program to recover lost or forgotten passwords to ZIP, ARJ, RAR and ACE archives. Implements fast and customizable brute-force attack, dictionary-based attack and very effective known-plaintext attack. Supports WinZip AES encryption. Advanced Password Generator is a application designed to generate passwords of any length. Recover or replace passwords to protected files created in ACT! contact management software (from Symantec, Best Software and Sage). All versions of ACT! (up to 2006) are supported; passwords are recovered (or removed/replaced) instantly. Passwords Base will keep all your passwords in a secure database, so you only have to remember one single master password. A user-friendly and intuitive interface makes it easy to manage your passwords. AnyPassword uses a tree structure form to store all your passwords. An advanced search guarantees quick access to your private data and a strong encryption mechanism prevents unauthorized access. Besides, AnyPassword supports a variety of languages. This site does not contain serial number, crack, keygen Easy Password Storage serial number : serial number is the simplest type of crack. A serial number(cdkey,product key,etc) is register the program as you may already know. a crack or keygen may contain harmful software. If you cannot find the exact version you want, just give it a try. for more information read .nfo/.txt/.diz file include in zipped file.